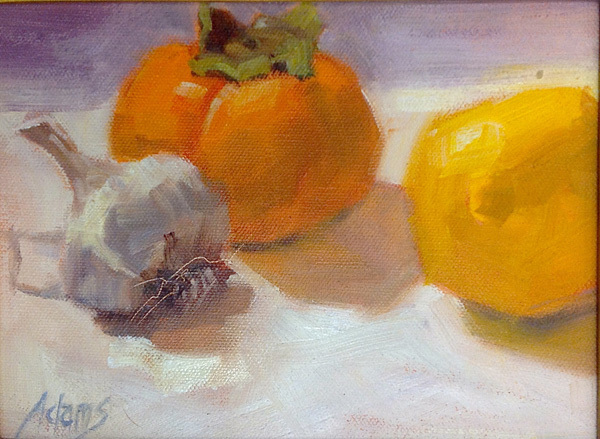 Persimmon and Friends, life study 6X8"
I have been learning to paint all my life, and teaching others that are learning to paint for over three decades. I have met those that only paint at workshops, those that are afraid that taking workshops will deter them from developing their own style, and those that attend workshops and glean what is useful to them and see how it might create growth and provide tools that they can apply when in front of their own easels. They stay open and curious, and work hard. I think you can guess which group experiences the greatest growth. 2. Study with someone that knows how to teach. Brilliant painters are not always good teachers. Painting and teaching painting are two entirely different skill sets. Ask around and see what kind of reviews previous students are giving that instructor. Try not to listen to those that are typically full of sour grapes. Ask more than one previous student to make sure you are getting fair review. 3. After a workshop, read the notes, and review and practice what was offered. It is important to lock in the learning with practice. And, as in an AA group, "take what you like and leave the rest". 4. Recognize that workshops shorten the learning curve, which is awesome, but they are not a substitute for easel time. You've got to practice! Keep those brushes wet. 5. Don't worry about not developing your own style because you are being too strongly influenced by an instructor. That will only be a problem if you study with only one instructor, and if you do no painting on your own. Style evolves as a function of many hours of painting experience. You do not "create" your own style, so much as uncover it over hours of painting in your own studio. It develops much as your writing signature did - it already exists. Right now. It just has perhaps not become fully obvious yet, but you can trust that it will IF YOU DO THE WORK. Well, I hope that is helpful to in some measure. I wish you all many happy easel hours! Please contact me by email: gayemadams@gmail.com. Registration is taking place now. The workshop includes skill drills, critiques, demos, and individualized coaching on your studio work. 4. Create Compelling Light: March 16,17,18 Kube Gallery, Fort Langley. Please feel free to email me at gayemadams@gmail.com with any questions you might have for me. I'll be posting some upcoming images from my Santa Barbara painting trip coming up shortly, so stay tuned. I also did some demo videos down there and will post them before long. I'm just in the throws of learning IMovie so I can edit the darn things. I'm such a luddite. Honestly. 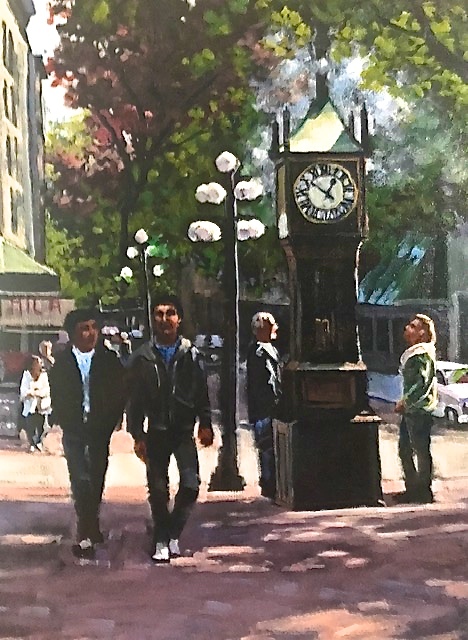 The Steam Clock, oil on canvas, 18X24"
Painting people in the landscape (or urbanscape as is the case here) is great fun, but also pretty tough. Here's why it's tough: we think if we are putting in people in our pictures we need to put in detail. It's not true - we can suggest a lot with gesture and a few strokes. Here's why that just doesn't work: When we see people in a setting, unless we are talking to them and they are directly in front of us, we don't really see details and fine features. We see shapes, values, colors and edges. 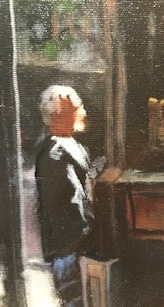 If you try to put it all in, especially if the figures are small, not only is it difficult, but it usually makes for a fussed over looking painting that somehow just doesn't read well. Knowing what NOT to put in is often the trick in painting, which is why I blew up some detail here so that you could see that I haven't painted detail - the detail is merely suggested. 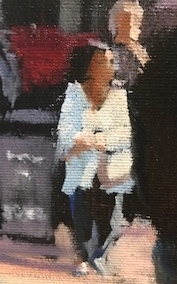 More detail is needed as human subjects get larger within the painting, but even then, hold back. As in life, so it is in art - less is often more. I tell the folks that come to learn from me that you can leave an incredible amount out, as long as what you put in is RIGHT. The right shapes, values, colors and edges. I know I sound like a broken record here, but judge for yourself. Give me some feedback if you have some comments around this. I would love to learn your experience with inserting people into your paintings. Let me take this opportunity to give you an update on what is on my teaching roster for those that might be interested. I leave for sunny Santa Barbara this next Tuesday, and I look forward to sharing that adventure with you via some upcoming blog posts. Stay tuned, and keep those brushes flying! STUDIO WORKSHOP - March 28 - May 3 (six consecutive Thursdays, 10am till 2 pm) click here. This is a studio workshop with demos, critiques and one on one coaching. March 16 and 17 CREATE COMPELLING LIGHT Kube Gallery, Fort Langley. email gayemadams@gmail.com for further info. Weekly Studio Workshop Starting November 8! Well, it's that time of year again. 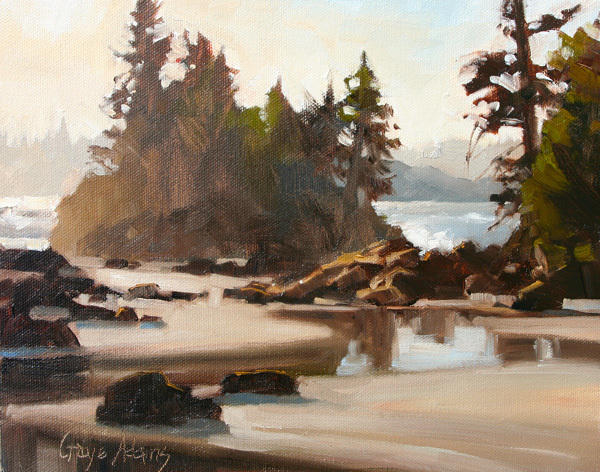 Plein air days are numbered, and I am preparing to settle back into my studio work for November and December. As much as I enjoy painting in the great outdoors, there is a rhythm to my studio work that I enjoy as well. It could have something to do with the hot cup of coffee and the Ted Talks I play in the background. The sound of the rain coming down while I work away the hours, waiting to see what will happen on the easel. It gives me a chance to pour through my plein air studies and photo references, like nuts gathered for the winter, and imagine what might be born from them. It's a lovely moment when inspiration strikes and I know exactly what I want to paint. -How big does this painting want to be? -How shall I compose this to make sure the viewer is engaged in the manner I intend? -What do I intend? What am I trying to say? All of these things to consider before beginning can create "easel pause". It is easy to lose momentum when we stop to plan. And when we don't plan, it can be quite a roll of the dice as to whether the painting turns out to be really strong or just mediocre. I'm a great fan of planning and making good decisions when approaching a large piece. If I am going to invest a considerable amount of time, I want to give myself every opportunity for success. In my six week studio class coming up, I want to address this process. I will bring my works in progress and share my process and help you add some tools to your belt to aid you in your process. I seek to create an engaging and supportive atmosphere. I will do some demos, we will have some critiques, and we may even do some painting exercises to expand your present skill set, which is a lot of fun. Plein Air Study for "Crystal Cove", 8X10"
I have been teaching folks to paint for over 30 years now, and, more importantly, teaching MYSELF to paint for much longer than that. One thing I am thoroughly persuaded of is that working from life will increase your painting skills sets faster than anything else. 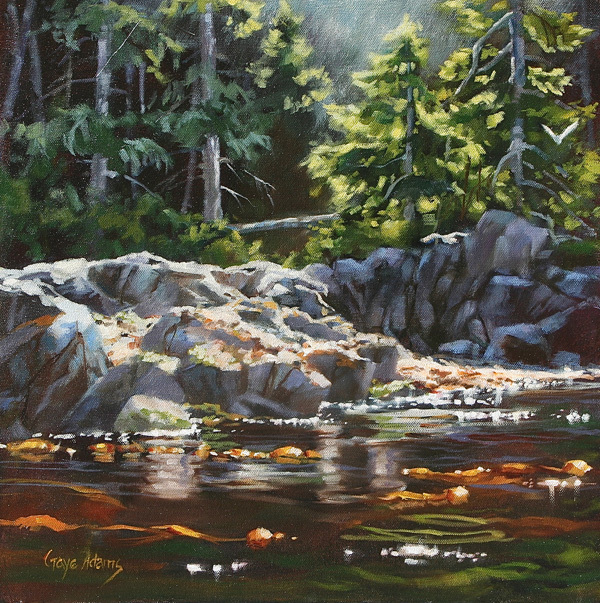 I find the genre of painting doesn't matter so much - whether painting the landscape on location, the model, or the still life in the studio, it seems to be a different set of "seeing" muscles are required to paint from life. Or perhaps it is just a different level of seeing, one that requires greater concentration and more decision making. The tendency of those early in their development as painters is to paint from photo reference material. It is the most convenient way to paint certainly, and takes off the time pressure inherent in painting from life. I think it is important for learners to understand that the photo is just a springboard for studio work, and if you are tied very closely to the photo in front of you, it has it's limitations. We can tend to take it too literally, and rely on the camera's decisions as absolute truth, which it certainly is not. Don't misunderstand me, please. I use photo references very regularly in the studio and find them indispensable, but my greatest growth as a painter has come from my practice of painting still life in the studio and painting en plein air regularly. Because of this, I have a passion for teaching painting from life. I feel it is a really great learning tool. It's tougher to do, but well worth the effort. It is scales and arpeggios for the eye, push ups for your perception muscles. It doesn't matter if the paintings turn out (and many of them won't initially), but the point of the excercise IS the excercise. If you have interest in any of the above workshops, please don't hesitate to email me directly: gayemadams@gmail.com. It would be my pleasure to help you with your particular learning curve. All the best to all of you, and happy painting! Materials and images protected by copyright © Gaye Adams 2013 . Awesome Inc. theme. Powered by Blogger.